1. Preheat the oven to 200ºC, gas mark 6. Melt 40g butter in a medium pan, add the flour and cook for a minute, then whisk in the milk. Bring to the boil stirring, and simmer for 5 minutes, stirring, to give a thin white sauce. Season well. Heat the remaining butter in a pan, add the spinach and toss it in the melted butter. Cover the pan and cook until wilted. Boil the spinach quickly to reduce any liquid. Season and add the oregano and nutmeg. Cool and stir in the ricotta. 2. Heat the olive oil in a non-stick frying pan, add the grated courgettes and cook for 5 minutes until golden. Add the garlic and cook for a minute then season well. Stir in the basil and half the pecorino. Season to taste. 3. 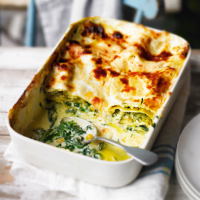 Layer up the ingredients in a buttered ovenproof dish starting with a layer of white sauce then lasagne then spinach and courgette then pine nuts. Continue until all the ingredients are used up finishing with white sauce. Sprinkle with the remaining pecorino and bake for about 40 to 45 minutes until golden and bubbling. Serve on warmed plates with a tomato and onion salad. This recipe was first published in Tue Aug 12 15:51:00 BST 2014.